After church on Sunday afternoon, August 14, a message popped in my Facebook. It was from Princess Soma Norodom. Since her conversion to Christianity last year, I have occasionally exchange message with her and so this did not come as surprise. What surprised me was that my she just published her new book, Royal Rebel and that my name is mentioned in the book. Curious as to how my name would ever merit an attention, I requested a friend in the US to get me a copy. Few days ago I received two e-versions of the book. After reading few chapters in the beginning, I went straight to the last chapter and look for my name. Guess what? Royal Rebel has a quote from my blog post, Cambodian Princess Soma Norodom Meets Jesus, last year about Princess Soma's conversion to Christianity through the power of a dream. You will have to get your copy and find out. 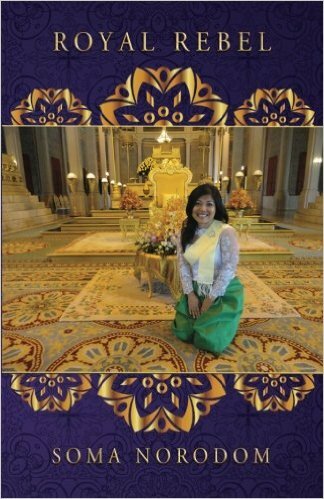 In the book, I also read that this Cambodian Princess has Filipino blood running in her veins! We'll she's only sixteenth Filipino from her maternal grandparents. Although I have not finished the book, I can tell you it is well-written and worth reading. The author used simple English any non-native English speaker can easily understand. I will try to write a brief review after I read the book. Here is my picture reading the book in my kindle which appeared in her website. along with others who had purchased the book. 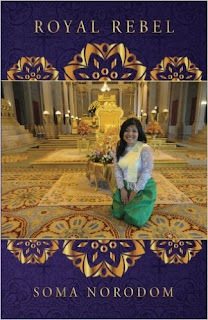 Taken from Princess Soma Norodom's website!